and look what arrived in the post last week another pin!! and i don't just mean in the size of my craft stash!!! although there is definitely alot more of that! In the past 5 years I have made new friends both here and abroad, I have met fellow crafters who have taught me new skills and become really good friends, I have earnt money which has regulaly helped pay bills and covered the costs of my crafting obsession and more importantly helped me to develop an outlet for my creativity which not only has helped me with depression but has helped others to meet new friends, find a creative outlet and helped them learn new skills while having fun. 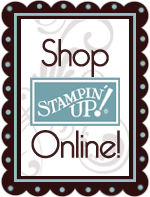 I am truly thankful to my friend Karen who introduced me to Stampin' Up! all that time ago without her I would not be doing what I am doing today. So I couldn't not post anything crafty today here is a simple card I created this week using some of the fab products from Stampin' Up! Creative elements stamp set with white embossing powder the scallop border punch and the gorgeous delicate design embossing folder.